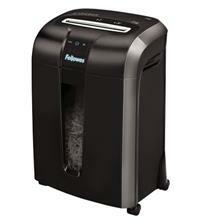 The Fellowes Powershred 73Ci is a cross-cut office shredder for 1-3 users. It shreds up to 12 sheets at a time into cross-cut particles measuring 4 x 38mm. It has a P-4 security rating which means it is ideal for the shredding of highly confidential material. The shredder shreds a range of material including paper, credit cards and CD/DVDs. It will also get through staples and paperclips, so no need to spend time removing these prior to shredding. It also has a good-sized 23 litre pull out bin for the shredded waste. The Fellowes 73Ci comes with a number of handy features including: SafeSense Technology that stops the shredder if hands touch the paper opening; a 100% Jam Proof system that eliminates paper jams and powers through tough jobs; and an energy savings system which reduces power consumption by powering down the shredder if it is inactive for more than 2 minutes. The shredder also comes with a 2 year warranty on the machine and 5 years for the cutter blades.